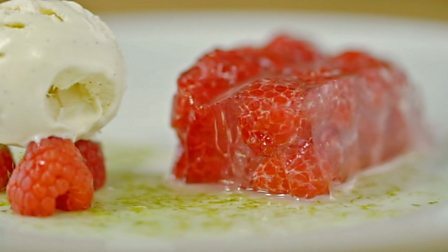 James Martin turns his childhood favourite, jelly and ice cream, into a grown up dessert. Equipment and preparation: you will need two 500g/1lb 2oz terrine moulds and an ice cream maker. For the jelly, put the sugar in a pan with 1 litre/1¾ pints of water and bring to the boil. Meanwhile, soak the gelatine in a bowl of cold water until softened. When the syrup has boiled, measure 1 litre/1¾ pints into a jug (reserving the rest for the sauce). Squeeze the gelatine out to remove any excess water and add to the measured syrup and mix gently to dissolve. Add the raspberry cordial and vodka and mix to combine. Brush the insides of two 500g/1lb 2oz terrine moulds with the vegetable oil. Take two large pieces of cling film and lay them in the moulds to cover totally, with at least 2cm/¾in hanging over the edge. Place the moulds onto a tray filled with ice. Spoon a 1cm/½in layer of jelly into each mould. Layer the raspberries onto the jelly and then cover with another layer of jelly. Allow this layer to set before adding more raspberries and jelly to reach the top of the mould (reserve a few raspberries to serve). For the ice cream, place the milk, cream and vanilla seeds into a saucepan and bring to the boil. When the mixture has just come to the boil, whisk the egg yolks and sugar together in a large bowl. Pour the boiling cream mixture over the eggs, stirring all the time, then tip back into the saucepan, place over a high heat and cook, stirring all the time, until the mixture has thickened. Remove from the heat and pass through a fine sieve into a bowl to cool down. Once cool, transfer to an ice cream maker and churn according to manufacturer’s instructions until frozen. Remove and transfer into a sealed container. Store in the freezer until needed. For the sauce, place 200ml/7fl oz of the reserved sugar syrup into a pan with the cordial and bring to a simmer. Dissolve the arrowroot in a little water and whisk into the syrup until it is thick enough to coat the back of a spoon. Remove from the heat, stir in the lime zest and set aside to cool. To serve, turn the jelly out of the terrines and remove the cling film. Cut the jelly into slices, and serve with a few raspberries, a quenelle of ice cream and a drizzle of sauce.